Writing about her life growing up in the Forest of Dean in the early twentieth century, she detailed the intricacies of village and family life amongst its working class mining community. Leaving her beloved Forest as a teenager to work ‘in service’, she returned after the war, married, to bring up her family. Her career as a writer began in later life when her handwritten stories were serialised on BBC radio’s Woman’s Hour before being published as the book A Child in the Forest. As well as several more books about her life and the people she knew, she also wrote short novels, and was an accomplished performer of her work, making several recordings.. Her books remain an invaluable insight into the period, the lives of working class men and women, domestic service, rural childhood, and the Forest of Dean. Winifred Foley was not published until after her sixtieth birthday. The story of how she came to be published is remarkable. ​Winifred was an avid radio listener and heard an appeal on BBC Radio 4's Woman's Hour from John Burnett, an academic collecting autobiographical stories as source material for studying working-class lives. He appealed for listeners to send in their stories. He received a manuscript described as ‘more bulky and dog eared than most’ and recognised its potential (Winifred had written her account in a Woolworths exercise book). Pamela Howe, a BBC producer, went to meet Winifred and through her the manuscript was adapted, early in 1973, into a Woman's Hour serial, adapted by Virginia Browne-Wilkinson. The book, attractively packaged by the BBC, followed in 1974. ​Various further editions have followed published by The Forest Bookshop's Doug McLean, and a revised version titled Full Hearts and Empty Bellies published in 2009 by Abacus. Winfred Mary Mason was born at Brierley (near to Cinderford) on 25th July 1914. She was the fourth of eight children, five of whom (including herself) who survived into adulthood, her older sister, Bess (4yrs older), two younger sisters and a brother. Her parents, Charles (Charlie), and Margaret Daniels (born in Wales), had married in 1909. Charlie was a coal miner, and at the time of Winifred’s birth he was away working in South Wales. Once home again he was to be a significant influence in Winifred's life, with his love of books, music, politics and debate. If he had a fault, it was the spending of sixpence on a book while his ragged shirt-tails were hanging through the ragged patches of his moleskin trousers. he loved to discuss his reading with his cronies. The fireside talk we overheard between them was full of H.G. Wells, Einstein, God, Darwin, Shaw and Lenin. As she recounts in No Pipe Dreams for Father, her dad was to speak up against the mine owners during a strike, and as a result faced seven years of victimisation from employers meaning difficulties for him in finding pit work locally. He would find work again underground: Charlie was killed in 1945, aged 57, in a roof fall at Northern United colliery. Growing up Winifred was surrounded by significant women: her older sister; sharing the family home with her beloved great aunt; visiting her Granny; being taught by Miss Hale; her aunties next door; and of course 'Mam'. It was her mum who struggled to make ends meet in times of hardship, finding ways to put food on the table, keep the children clothed, and it was her mum that wrote to her weekly whilst the still-young Winifred had left home. ​The family lived at Brierley Banks – the hamlet just up the hill behind Brierley-proper. It was a close community and Winifred grew up with an extensive extended family of Masons in the surrounding houses. By modern standards the whole community was poor, but even so, there were subtle gradations as Winifred would later recall, describing hers as a 'middling family'. One resident even recalls Winifred's family as being (relatively) 'posh'. Winifred's writing details the harsh, and sometimes cruel, realities of working class life in the Forest of Dean with its periods of extreme poverty. Always though there was also the warmth of family, the beauty of the Forest, and the resilience, humour and ingenuity of the Forest community. School was a mile walk up the steep hill to Ruardean Woodside Primary School. In A Child in the Forest she describes how sometimes the headmaster, Mr High, would with the slightest provocation, grab pupils from behind their desks for a beating with one hand and a whack from his stick in the other. One day he noticed some of Winifred’s writing, and asking her to stand she expected a beating but instead he asked her to read her work out to the class, and promptly marched her into the top class to be taught by Miss Hale. Miss Hale recognised Winfred's potential and took her under her wing. Winfred would later describe a memorable invitation, a few days before her fourteenth birthday, to go with friend to Miss Hale's for tea - an insight into how the better-off lived. Winifred's compulsory full-time schooling came to an end when she reached fourteen. Like many young women from poorer backgrounds at that time, she had little choice but to go 'into service' - working as a domestic servant. Her sister Bess had already done so and Winifred was to follow. (Her younger sisters would be saved from this fate as factory work opened up to women during the war). Whereas boys were often able to at least remain with their family and pals with work in the local mines (tough as this was) or other industry, girls often had little economic choice at the time but to leave home - sometimes long distances away - for a life of domestic drudgery. Winifred responded to a newspaper and was herself soon leaving home to work for a family in Stoke Newington, London. We knew it was good-bye forever except for the respite of our annual two weeks' holiday...In service, our bellies were mostly filled as they could never be at home, but there was an empty ache in many of our hearts. ​​After six months in London she returned home - her little sister was sick and she wanted to help her Mam. She was soon though needing to work again and became maid to an elderly lady in the Cotswolds; then to a family in Cheltenham, and then on a farm in Wales. These different jobs were over the course of three years, and when she decide to leave the farm she was back in London again, this time in Aldgate. Her experience here was very different, being treated at times close to being a member of the family, not needing to wear a maid's uniform, eating at the same table, sharing a bedroom with the daughters, sharing in conversations. She stayed this time for two years, before taking up a job at College Hall, the student accommodation for University of London, then at a boarding house near Paddington Station, and following that worked as a waitress in a Lyons Cornerhosue. The sheer hard graft; missing home, family and the Forest; the sometimes petty snobbery of life 'in service', all jump off the pages of Winifred's auto-biographical writing, in particular in A Child in the Forest, and in In and Out of the Forest. She gives us an insight too into the lives of other working class women, struggling to escape poverty through the limited opportunities available to them. What's also clear though is that her regular change of jobs, and change of locations, opened up her life to many new experiences, and friendships. This is a young woman (very young to a contemporary reader) growing up, finding her feet, and making a way in the world - still very connected to and yearning for her family - but also sometimes too experiencing the rich variety of metropolitan life: 'I had always found London a place of wonder,' she wrote in A Child in the Forest. Trips to the picture house, living with two different Jewish families, meeting students from abroad, coming across young gay men at the boarding house, attending political meetings, were just some of the experiences of her time in London. We had shared great childhood poverty in common, mine in the Forest, his in the slums of Paddington. We also shared a hatred of war and of the ethics of capitalism. They were married on Christmas Day 1938, with Winfred's mum, brother, and younger sister travelling up to London for the wedding. They moved into and ran a newsagents for a while until, after the outbreak of war, they heard of a job for Syd in the Forest, planting trees. They were soon living Forest of Dean next to Winifred's parents where they soon had their first child, a son. After a spell in London again towards the end of the war, Winifred returned to the Forest to have their second child, another son, later to rejoin Syd in London. It would be ten years before they all returned to the Forest, this time to stay. They would have another son, and finally a daughter. ​In 1976 A Child In the Forest was adapted for BBC television by Warren Mitchell. Produced by Moira Armstrong this single play called Abide With Me was broadcast on BBC2 on 11th April 1977. The cast included well-known actors such as Phyllida Law, Cathleen Nesbitt, and John Nettleton, with ‘Winnie’ played by Ann Francis. 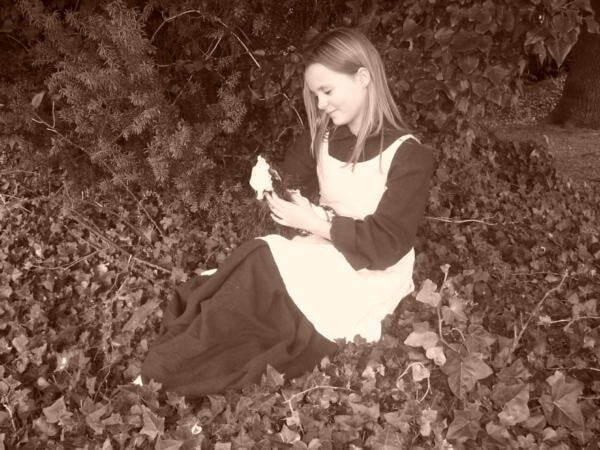 In 2001 HTV West produced its own dramatization, title A Child in the Forest, directed by Peter Watkins-Hughes. The cast included John Altman at the time best known for his role as Eastenders’ ‘Nasty Nick’ Cotton. A Child in the Forest was adapted for the stage by David Goodland. It was first performed at the Swan Theatre, Worcester, in 1989. It was staged at the Cheltenham Everyman Theatre in 1991. 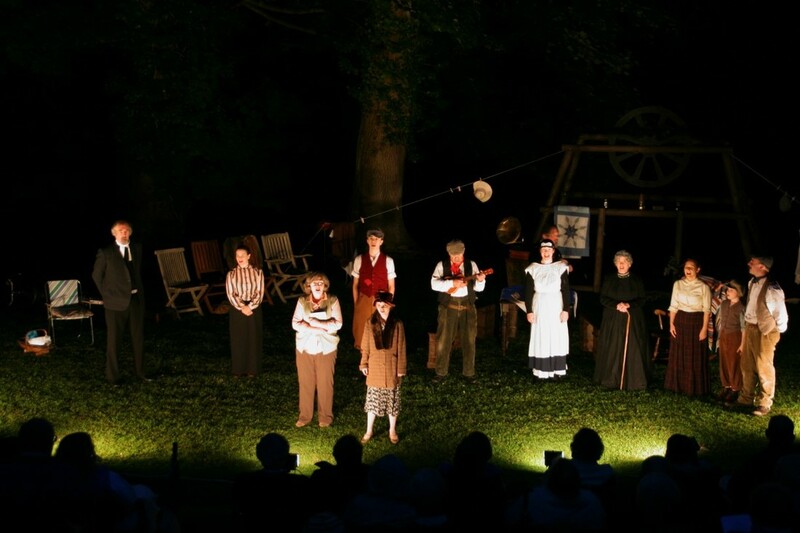 In 1992 it was was performed by the Avon Drama Association at the Ashton Court Sunken Garden in 1992 . Winfred's political beliefs would have been born out of both the hardships and strong sense of community of working-class life in the Forest; the influence of her politically-minded father and his friends; preaching at the village chapel and Sunday school; and her experiences of the class system working in service. It was her sense of social justice, and her close relationship with the Jewish family she lived with that motivated her to march against Oswald Mosley in London. In later life she was a supporter of CND.